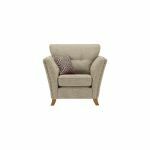 The beautiful Grosvenor armchair in Beige with Grey Scatters is designed to bring contemporary style and irresistible comfort to your living room. The gently flared arms cut an effortlessly modern silhouette, and also provide extra space to relax. 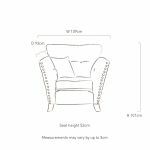 The cosy plump-free, foam seat cushions ensure long-lasting shape retention, while the complementary scatter cushions make the sofa the ultimate spot to unwind! Made using robust hardwood throughout the framework, the Grosvenor armchair is built to last and retain its looks for many years to come. Finished with stylish chrome button detail and solid oak feet, it has a luxury look that suits both modern and more traditional homes. Browse the entire Grosvenor range and discover beautifully coordinated furniture to complete your dream living room!